The First Amendment is one of the cornerstones of U.S. democracy. Former Director of the New Jersey Division of Consumer Affairs, Levin is chairman and founder of CyberScout and co-founder of Credit.com. He is author of the critically acclaimed book, Swiped: How to Protect Yourself in a World Full of Scammers, Phishers, and Identity Thieves. Adam K. Levin is a nationally recognized expert on cybersecurity, privacy, identity theft, fraud, and personal finance and has distinguished himself as a fierce consumer advocate for the past forty years. Former Director of the New Jersey Division of Consumer Affairs, Levin is Chairman and founder of CyberScout and co-founder of Credit.com. He is author of the critically acclaimed book Swiped: How to Protect Yourself in a World Full of Scammers, Phishers, and Identity Thieves. Levin’s mission is to educate consumers, businesses, law enforcement officials and lawmakers on identity management and protection, privacy, credit, and election security issues. He is a go to expert and makes frequent appearances on national TV and radio program. A graduate of Stanford University and the University of Michigan School of Law, Levin is a highly sought after speaker who, during his career in the public and private sectors, has shared his expertise with numerous state and federal regulators and legislative committees, and appeared before a wide variety of organizations–government, law enforcement, public interest, education, human resources, insurance and financial services—throughout the United States and Europe. 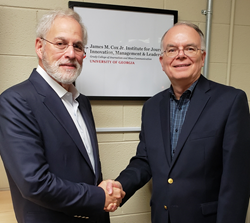 The James M. Cox Jr. Institute for Journalism Innovation, Management and Leadership at the Grady College prepares students and professionals for leadership roles in the news media. By sponsoring intensive training programs and funding applied research, the Cox Institute is at the forefront of addressing the strategic challenges faced by contemporary news organizations. The Cox Institute was established in 1990 by the late Conrad Fink, a legendary journalism professor in the Grady College. It is named for the late James M. Cox Jr., who headed Cox Enterprises and Cox Broadcasting Corporation from 1957 until 1974.